The legacy pass manager's instcombine pass. 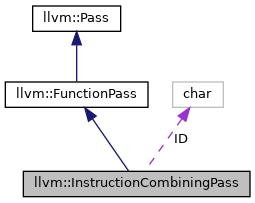 This is a basic whole-function wrapper around the instcombine utility. It will try to combine all instructions in the function. Definition at line 42 of file InstCombine.h. Definition at line 49 of file InstCombine.h. References llvm::createInstructionCombiningPass(), F(), llvm::PassRegistry::getPassRegistry(), llvm::initializeInstructionCombiningPassPass(), and runOnFunction(). Definition at line 3531 of file InstructionCombining.cpp. References llvm::AnalysisUsage::addPreserved(), llvm::AnalysisUsage::addRequired(), llvm::LazyBlockFrequencyInfoPass::getLazyBFIAnalysisUsage(), and llvm::AnalysisUsage::setPreservesCFG(). Definition at line 3546 of file InstructionCombining.cpp. References llvm::AMDGPUISD::BFI, combineInstructionsOverFunction(), llvm::ProfileSummaryInfo::hasProfileSummary(), ID, INITIALIZE_PASS_BEGIN(), and INITIALIZE_PASS_DEPENDENCY. Definition at line 47 of file InstCombine.h.